This is the scene of the Rescue of a climber who fell in the presence of his son on the cliffs West of Portsoy, Aberdeenshire. The male, aged 55 would have sustained a broken leg and was conveyed to Hospital, by Coastgurad Helicopter. It is though was taken to Raigmore, Inverness. Photographed by JASPERIMAGE ©. It is understood that the man, thought to be in his 50s, was climbing with his son when he slipped and plummeted from the height. 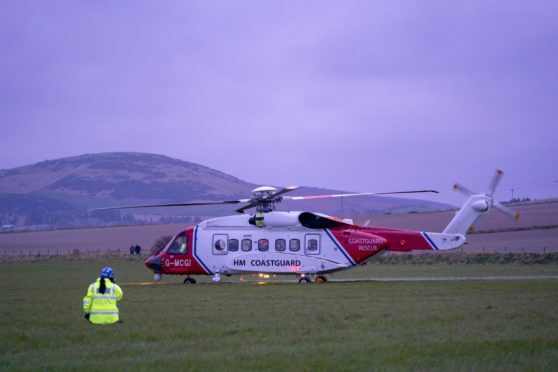 Coastguard crews were scrambled to Redhythe Point, west of Portsoy, shortly after 6pm. A helicopter was sent from Inverness, and the man was winched from the foot of the cliff at about 8pm with a suspected broken leg. A spokesman for the service said: “The helicopter was able to come in and lift the man from the bottom. “He was then taken into it and flown to Raigmore Hospital in Inverness for treatment.